From time to time I like to spec my one of my racquets exactly like one of the top pros just as a small experiment. I have done it with Novak Djokovic, Rafael Nadal, Roger Federer, Juan-Martin Del Potro, Andy Murray and now I thought it would be fun to play with Fabio Fognini’s actual racquet specs. 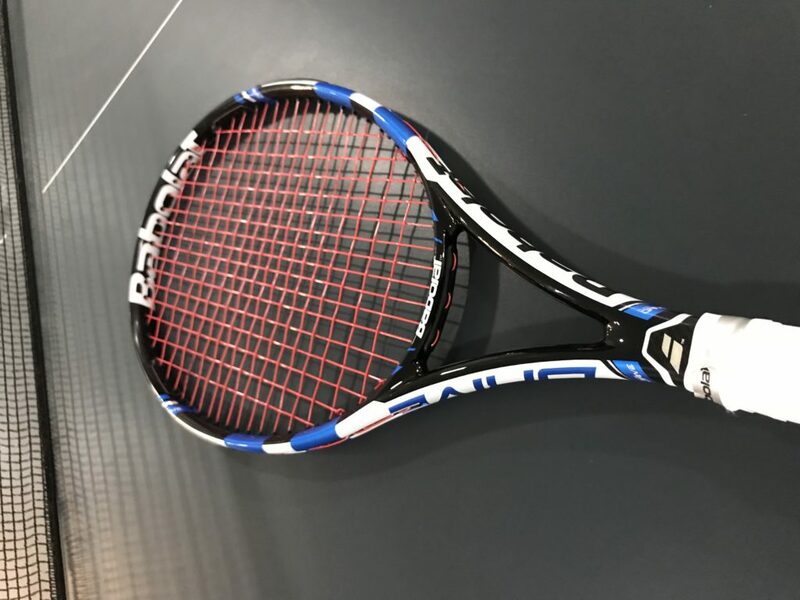 Fabio Fognini’s actual racquet is a Babolat Pure Drive Original, the first version of the Pure Drive that came out in 1997. 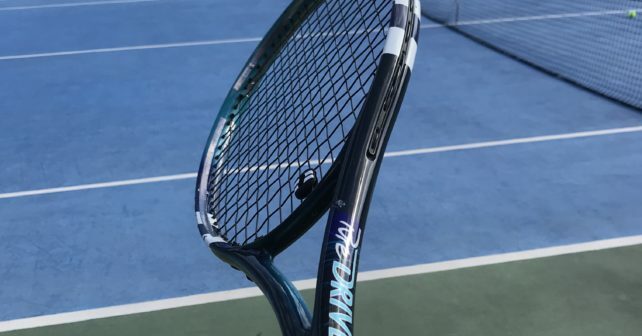 The racquet was mainly popularized by Carlos Moya who endorsed the racquet but was actually using the Babolat Soft Drive for a long time underneath the paint. As you know I am a fan of both the Soft Drive and the first edition of the Pure Drive due to the lower stiffness rating. Also, the rather open string pattern enables you to hit with some intoxicating spin. Fabio Fognini’s actual racquet specs are quite heavy to swing. I got a few of his personal racquets through a forum but sold them too rapidly since I was enjoying the Soft Drive too much at that time. It is quite easy to see that the racquet does not have any kind of Cortex and that the woofer-less grommets belong to that of the Soft Drive/Pure Drive Original mold. The pic below is of one of my previous Fognini pro stocks. Notice the painted Cortex above the grommets. These are not his actual strings though. Strung weight: 11.9 oz. / 339 gr. 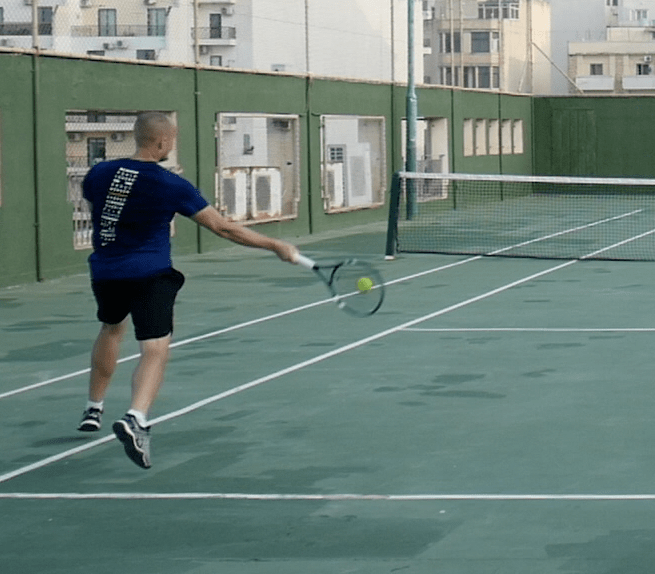 Fabio strings his racquet with Babolat RPM Blast at 25 kg. The swing weight of Fabio’s racquet is hefty as the balance is close to even, which is very rare on the ATP Pro Tour. Carlos Moya also liked to play with a LOT of weight in the head and actually played his racquet head-heavy, which is astounding since I have no idea how you swing it effectively for hours. Back to my experiment, so I copied Fabio’s specs to a T on my Babolat Pure Drive Original. Then I took it out to the court for two 90 minute sessions against different opponents. I have quite familiar with the racquet mold as I still take out the Soft Drive from time to time and my specs are not way off Fognini’s, although I land around 334 grams and 32,6 cm balance these days, which means my swing weight is far lower. This was very much noticeable on my first swing with Fabio Fognini’s actual racquet specs. It was HEAVY and POWERFUL. 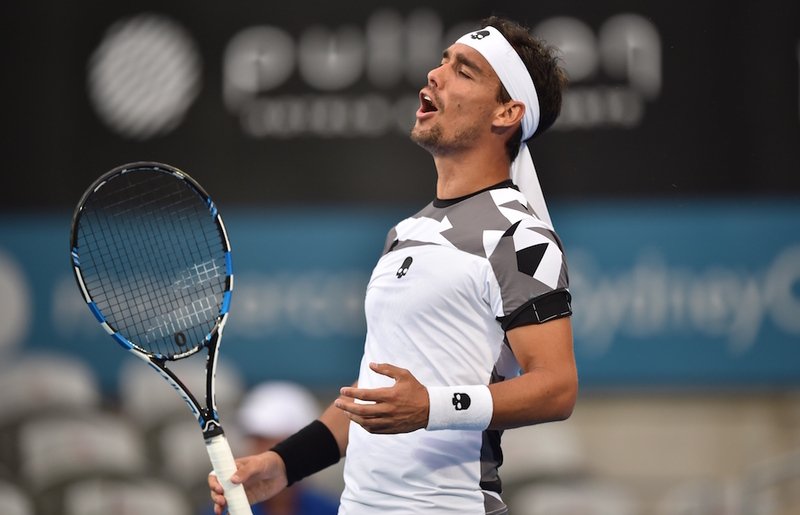 Fabio Fognini’s actual racquet specs are not something I would recommend to anyone who is not Fabio Fognini. It is simply a lot to swing and the racquet does feel sluggish for a lesser player (such as myself). It took me a long time to adjust my swing and I really needed to put a lot of effort into my footwork to make sure I prepared correctly for every shot. I am not unfamiliar with heavy tennis racquets, but when they get this head-heavy and with such a high swing weight, it is definitely something else! After a while, I got dialed in a bit better and ended up playing pretty well, but still, I was late on too many shots. The only thing that worked really well for me with this setup was the serve and I ended up hitting eight aces in one match, which is rare. The Pure Drive Original is still an excellent racquet and something I could easily start using in tournaments. It is a bit stiffer than the Soft Drive so I get a bit more pace on my shots, but it is far more comfortable than newer Pure Drives with a strung stiffness rating of 64. Fabio Fognini’s actual racquet specs play nice overall, but it was a bit too heavy to swing and offered too much power at times (mainly because I was late on the ball). The stability was great at net and on the slice, but I really needed to focus on my preparation and footwork to play with this heft. As soon as I removed some grams from the head and put them on the handle instead, my game felt a lot more at home. Copying pro player specs to the gram can be a bad idea unless you are a pro. You need to find the specs that work for your game and most of us tennis nerds are not close to Fognini’s level. Still, there is a lot to learn from the feisty Italian’s game. I especially like his short and uncomplicated backswings. The way he times the ball is quite inspirational. And the extra weight in the head provides some amazing stability. I enjoy testing pro player specs because it teaches me something about my game. And what I learned from playing with Fabio Fognini’s actual specs is that I like the stability and feel from the racquwet, but can’t handle the high swing weight. So I went down to my standard spec (only a few grams lighter than Fabio’s, but much more head light) and I am actually enjoying this spec on both my Pure Drive Original and my Soft Drives. Do you ever try to customize your racquets to pro player specs? How does that work for you? Let me know in the comments below. I did not do that, sadly. It is not that difficult though. The Yonex DR 98 is a great racquet too. Think it would be interesting to try in a heavy spec. Never did that. Nice story there. Actually a fan of Fognini here, amazing technique he has. Very unique. But surely difficult to perform in that level. Was looking for a good tournament setuo for myself and got my hands on the original setup of Sela. Usopen edition from 2014, H19 i believe. The thig is it came with yellow strings that he used and here where i live nobody could recognize this string. I played with it like a dream for couple of months but thengot heavy and unresponsive( i have a pingpong history so my base shot is attacking with topspin , heavy topspin, i dont have any defense at all).. the racket used to give me an amazing depth that i could push every opponent easily no matter which level they were. So I had to change the strings but cant find what was on it. I read some info on what might suit me. Tried wilsons champions choice duo, babolat natural gut with no success..
Any ideas what might have been that yellow string on Sela’s wilson? Or can you suggest anything similar? This is the stick I have btw, if it`s gonna be any help. I rechecked and should be a H22 .